Workshop hosted by The American Chamber of Commerce in Thailand, The Westin Grande Sukhumvit, 7:30 – 10:30 a.m.
“Coaching” is a popular buzzword in management and HR circles. Everyone believes the promise that a coaching culture boosts performance, attracts top talent, and retains high performers. So why do so many organizations fail when it comes to building a coaching culture? In this hands-on workshop, leadership advisor & executive coach Dr. Gerrit Pelzer will help us learn from the three most common mistakes that companies make when trying to build a coaching culture: having no clear definition what a coaching culture is, having no clear objective, and underestimating how difficult it is to build such a culture. Since coaching is still in its infancy in Thailand, we will learn what coaching actually is, what it is not, and how to help it happen in our organizations. 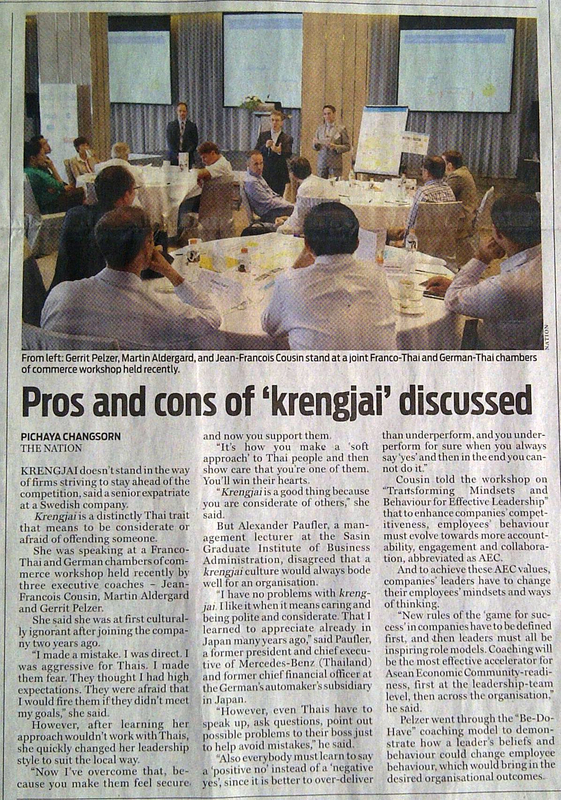 Gerrit’s most sought-after coaching talk one more time in Thailand and for the first time in Myanmar! January 17, 2019 at 6 p.m. Bangkok in collaboration with the Danish Thai Chamber of Commerce. More details and registration on the DanCham website. Swissotel Le Concorde Hotel, Bangkok, Thailand, 9 a.m. – 4:30 p.m. I am honored that the International Coach Federation Bangkok Chapter has invited me as a guest speaker to talk about my favorite topic: how corporations can build a coaching culture to improve individual and organizational performance. Event with the ICF Bangkok Chapter at Sasa Nives, Dipak Jane Hall. More details will be published soon! Coaching is an essential leadership skill that managers use to develop employees’ full potential and improve the performance in their units. Some say you can’t be a great manager without being a great coach. While many organizations invest heavily in coaching training, there are three common challenges that prevent many managers from actually using more coaching skills. Learn how to overcome these challenges and help your managers coach more effectively. Boost Accountability, Engagement and Collaboration in your teams. And this starts from the top. Leaders first need to evolve their own mindsets and behaviors, before employees will change theirs. Photos are now on Facebook: click here to see them. Coaching by external or internal coaches is a well known approach to develop individual managers in an organization. A coaching culture on the other hand expands the scope of coaching to impacting the whole organization. Companies that are intentional about integrating coaching as a comprehensive and organization-wide approach move their workforce towards higher performance. Join with your team this playful workshop to challenge your thinking and trigger new behaviours for better collaboration among Thais and foreigners at work. To enhance companies’ competitiveness in the AEC context, employees’ behaviors must evolve towards more Accountability, Engagement and Collaboration. To achieve that, companies’ leaders must first change employees’ mindsets and way of thinking. Photos are now on Facebook, too: click here to see them. We will together examine: •the leaders’ beliefs that enable or limit their ability to drive organizational performance and •impactful actions for leaders to enhance AEC behaviors (accountability, engagement, collaboration) across the organization. Photos are up-loaded to Facebook! Click here to see them. In order to achieve lasting change, people have to undergo six phases of change. Each phase is important, none can be skipped. Whilst Coaching is often deemed “action-oriented”, action is only one of the six phases leading to sustainable change. This webinar is designed for professional coaches. It is complimentary for members of the Asia Pacific Alliance of Coaches. You missed the webinar? No problem! Click here for the recording. Regular Group Coaching for Senior Managers and Executives. Typical Topics: Motivation, Perception Management, Communication, Time Management, Team Effectiveness, Work-Life Balance, and many more! The first public event of the ICF Bangkok Chapter with Frank Bresser, winner of the Global HR Excellence Award 2011, co-hosted by the German Thai Chamber of Commerce. I feel honored to be the guest speaker at Wall Street Institute at the occasion of opening their 15th training centre in Thailand. Join for free to learn key coaching skills to lead your organization to sustainable success! Dec 19, 2011 – Jan 15, 2012: 10 Free Goal Setting Coaching Sessions 2012! Promotion: 10 individual coaching session at no costs. First come, first serve! As acknowledgment of my gratitude for 107 MBTI® assessments in 2011, participation for my MBTI® clients is free! Maximum 12 participants for optimum effectiveness. Sign-up now to benefit from 20% early bird discount!